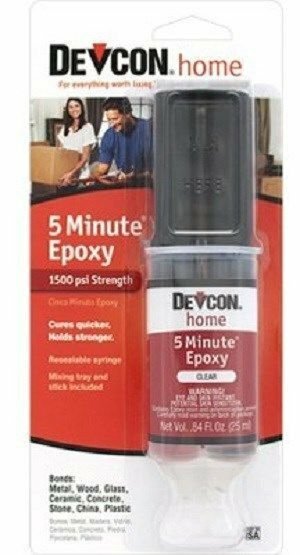 Epoxy paintable - fast drying in dev-tube - high strength"5-minute" clear - size 1 ounce - carded The syringe gives correct amounts of resin and hardener automatically. No measuring required. Includes snap-off-snap-on cap and handy mixing paddle. Works on metal, wood, chrome, glass, concrete, fiberglass, tiles, ceramic, china and more. Sandable and pa intable. Starts setting in 5 minutes. 1,500 psi bond strength.